The GE WBVH5200 shows promise as a reliable washing machine. It is equipped with features for laundry cleaning as well as those that focus on the convenience of using this washing machine. The GE WBVH5200 is an Energy Star qualified home appliance, which means that this washer is not only energy efficient to use but environment friendly as well. Consumers not only get to save on energy cost but also on water and detergent use because of its optimized cleaning action. With a loading capacity of 3.8 cu. ft., this front loader can hold heavy laundry and large loads. With this washer, users can actually wash a king-size comforter as well as drapes and bedding with more ease. Its rotary electronic controls such as the LED features and Adaptive Logic system enable users to monitor and choose the wash cycles for a better laundry cleaning performance. This washing machine also has a HydroMotion feature, which ensures the thorough washing of the laundry through reverse action. Despite its tough performance on germs, dirt, and bacteria, rest assured that it stays gentle on clothes. It takes good care of delicate and light fabric. But to achieve a better cleaning power, this washer has to be configured with the right settings. Because the washer is fairly easy to use, it doesn't take long time to get used to tweaking its control buttons. The GE WBVH5200 also has an end-of-the-cycle signal, a useful feature that helps in performing other household chores while loading the laundry. It has a bleach and fabric softener dispenser, which makes everything easier. This washer cleans well, operates with less noise, and effectively lifts stains and dirt, leaving a cleaner, fresher feel on clothes and other laundry items. This neat-looking washer comes with intuitive features that are easy to use and tinker with. Much of its appeal is derived from its relatively lower price. According to some consumers, one of the most helpful features of the washer is its king-size loading capacity. Because of its size, users can actually put larger loads into it and reduce the number of times they need to put in more laundry. Large blankets and king-size comforters, for instance, can be washed efficiently by this washer. Another quality that users like about this washer is its energy efficiency. As a front load washer, it reduces water and electricity consumption for laundry cleaning. Aside from its energy-saving qualities, using it is also time-saving. It takes fewer hours to finish the whole task despite stains and dirt that have to be removed. Some users say that what makes this front-loading washer a dependable household worker is its Adaptive Logic system, which enables them to select and monitor the right wash cycles. The end-of-the-cycle signal of this washer also helps on tracking the progress of the cycles. Best of all, this washer does a good job at taking good care of clothes. Although it thoroughly cleans, it is also gentle on different types of fabric. There's less worry when loading light and delicate articles of clothing. If there are various advantages to this washer, there are some drawbacks as well. For some consumers, the lack of options that are present in other washers is one of its limitations. As such, it does not have a built-in water heater. A built-in water heater can actually make the chore a great deal easier and faster. Aside from these, some consumers complain that though the washer spins silently, it creates some noise after a few weeks of using it. Because this washer is a front-loading machine, loading isn't easy as it requires bending down in order to put all the clothes inside the washer. For users who want to buy this washer, it is important to weigh things first before they decide on purchasing one. If they are after the efficiency of the washer, the GE WBVH5200 is a good household equipment. This washer has all the basic features needed for good laundry cleaning. It is also cheaper than other models and brands. Because of its energy efficiency, there's significant savings from water and electricity bills to be expected. 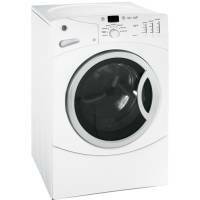 In the end, one may say this washing machine is ideal for those who are looking for a straightforward washer that's easy to use and free from other unnecessary frills. The big problem with it is that, unless you get the better model, which is basically the same but has additional preset wash cycles **plus a CUSTOM wash cycle**, which this model doesn't have, all of the preset wash cycles are slooooow, including the hilariously named "Speed Wash" selection, which clocks in at a blazingly fast 36 minutes. That's the *fastest* preset. That means that, for some people, all of the other presets are useless, because they all take longer than that, some substantially so (figure an hour on average). What's more, those times are just minimums, because the machine has a "tilt sensor" (which is a good thing) so if it detects that the machine starts going "bam!bam!bam!bam!bam!" when it spins because the load is too heavy, it slows the rotation way down to prevent damage to the drum. That's good, as I said, but it means that all listed times are minimums, and I've definitely had the 36-min "speed wash" take about 50 min. The higher models that have a "Custom Wash" feature take care of this, because you can program any kind of preset you want and, for example, create a *real* speed wash preset for very light loads, eg. 4-min soak, 4-min wash, 4-min rinse, 4-spin and you washed your favorite jeans in 16 min. Can't do anything like that here, so I would recommend paying a bit more and getting the models that have this feature... because, other than the speed thing, this is a good washer in every other respect, in my opinion. I HATE THIS WASHER. Its going on its 3rd motor! I don't have time for this nor the money. Why they can't make this expensive stuff last! We bought this model about five years ago and I thought it was my fault that the thing would never balance... I tried leveling it and even took it apart to see if there was a spring that was out of adjustment. The pump quit working on it, that was a 178$ part. Now the water level switch is malfunctioning and the unit won't stop draining... even after it is shut down, I have to unplug the stupid thing. Not happy. Well I guess i'll finally join the wall of shame. My washer has never been balanced; after paying the warranty amount of $169.99 continuously to have it balanced; I finally gave up and had my local appliance repairman come look at it. He ordered new springs for it....lasted about 2 months and then the banging noise was back. This washer is the most awful thing in our lives and we cannot believe that we have continued to let the banging barrel and burning smell cause us to be so uncomfortable. We just got back from ordering a new washer....if you can't beat'em get rid of 'em. We have had our machine less than 5 years. Within the first couple of weeks it started eating my clothes. I called the company and the repairman that called me back knew exactly what was wrong with it when I told him what it was doing. He ordered a new door gasket and came out a couple of weeks later to fix it. He told me it was a common problem. I asked him why they hadn't recalled it and he said it didn't happen often enough for them to fix all of them. Then, after we owned it a year or so, got a letter stating there might be a fire hazard and a repairman would be out to fix it in 2 weeks. Turn it off and do not use it until it is repaired. Seriously? We are a household of 4 and you expect me not to use my washer for 2 weeks. When they came out to replace the part, sure enough the wire that can start a fire had broken. The washer is NEVER balanced, bangs around constantly and has almost put a hole in the wall. It leaks too. The final straw was 2 days ago though when I thought it about burned down my house. I could hear it banging around upstairs so I went to check on it. As I was going up the stairs, I could smell burnt rubber. When I got to the top of the steps, my entire second floor was filled with smoke. I almost called the fire department until I realized it was the washer. It had already shut itself down by that point. As I took the clothes out of it, I found a long thin piece of rubber in with my clothes. Upon closer inspection, we found the inside of the door gasket had shredded and that was what caused the burnt rubber smell. My husband believes the bearings went out which caused the drum to shake wildly and shredded the door gasket. THIS THING IS JUNK, takes forever to run a load, and DOES NOT clean clothes well at all. Do yourself a favor and whatever you do, DO NOT buy one. I would have sent it back a long time ago if I could have. We purchased this washer about three years ago. We hate it! It is always out of balance and does not remove stains. Do not waste your money on this machine. I wish I could take my GE front load washer back to the store where I bought it and trade it in on anything. I ruined all my clothes and continue to have dark spots on everything. My whites are all dingy besides along the big gray spots. From caprets, to sheets, to towels, they look like car rags with permanent stains. Try wiping yourself with it. Pretty soon I will have nothing worth keeping but I can't afford to throw this washer out and buy a new one. Does anyone have any suggestions on how to fix it and how much it would cost? Please help me. Bought it less than 3 years ago from Sears. Never able to get it balanced. Now it totally broke down. Compared to the Whirpool wahser I had had for alomost 15 years, it is a piece of junk! This machine never gets anything clean. If I could trade it in or get my money back, the machine would be history. I bought this at Home Depot and didn't think they would sell me an inferior product - guess I was wrong ! lasted three years then tore itself apart--always unbalanced no matter what we did. We've only owned it a few years and we absolutely hate it! Any load of laundry with weight (towels or jeans loosely filled) takes 1 1/2 to 2 hrs. It never balances and you have to run the drain and spin cycle a few times to get most of the water out. Where's the energy saved there??? We've had technicians look at it a few times and they're very good at giving you a line of "more crap!!" Always out of balance. Found broken off screw in the washer after washing towels, so I know it came from inside the machine. In the basement on a concrete floor and perfectly level. Piece of junk! General Disaster is right. Machine is junk repairman cant fix it!! I have had this machine for 18 months. When it gets to the rinse cycle (no matter which wash setting it's on) the washer fills, immediately empties, the pump runs on for about 5 minutes then the washer goes to pause. Clothes just sit there all full of soap and the washer will not go any farther. Have had A & E Warranty repair here 6 times, ( we bought extended warranty) since washer does not show a code they have no idea what is wrong. They have replaced the board, pressure switch and the pump with no luck in repair. GE Customer Service said they would not do anything since it was out of MFG warranty. Lowes has agreed to replace the unit but with the next model up which has just as lousy reviews as this one. AUGH!!!!!!!! This washer does not get out stains and clothes mildew if left in overnight. I am very disappointed and wish I had done more research before purchasing. We purchased this washing machine a little over a year ago. It is loud, does not get out stains and leaves clothes and towels smelling horible. And now we have to replace the control panel and the front gasket. It leaks and we have spent a fortune trying to fix it. Don't waste your money. Look at a different brand completely.